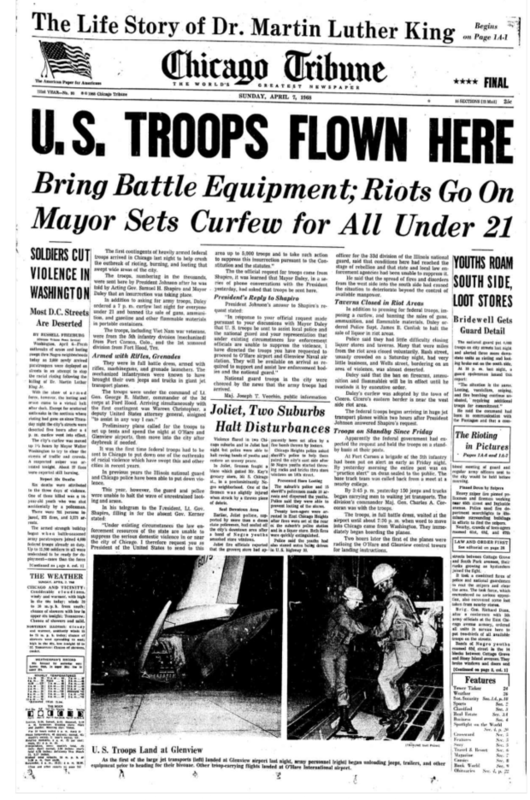 National Guardsmen don't have powers of arrest, but they did help enforce curfews during the 1968 riots in Chicago. Editor's note: This story was originally published Jan. 18. DOWNTOWN — When violence in Chicago gets national media attention, one refrain is heard again and again: Bring in the National Guard! Before being sworn in as president, Donald Trump suggested in a tweet that Mayor Rahm Emanuel "must ask for federal help!" to curb shootings that left more than 760 people dead in 2016. He followed that up by threatening to "send in the Feds" unless Chicago officials "fix the horrible 'carnage' " in the city. On Change.org, a petition calling for the National Guard to be brought into Chicago racked up more than 10,000 signatures last year. The suggestion has been made on both sides of the political aisle, but would bringing in the National Guard actually make Chicago more safe? "I think that would be a huge mistake," said Lance Williams, a Chicago native and a Northeastern Illinois University professor who has studied the city's gang violence. "The massive amount of resources that would be required to deploy the National Guard in these communities could probably better be used to address ... the root causes of the" violence. Has the National Guard come to Chicago before? The city's history with the National Guard is rocky. The National Guard and Chicago Police Department took part in violent clashes against protesting laborers during 1877's "Battle of the Viaduct," leaving 30 workers dead and 100 wounded. A few years later, Guardsmen fired into a crowd of people, killing four, during the 1894 Pullman Strike. 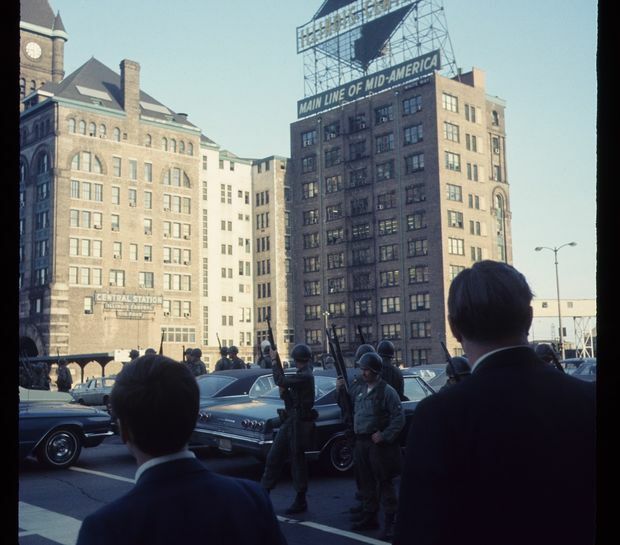 More recently, after the 1968 assassination of Martin Luther King Jr., the National Guard was called in to quell riots, particularly on the West Side, Williams said. Guardsmen patrolled and looked for people breaking curfews, Williams said. People saw the National Guard as an "occupying force," Williams said, leading to civil unrest and even violence. "The National Guards basically were stuck in the middle of the chaos," Williams said. "There was pushback, and there was violence directed at the National Guard. "We would have the same thing happening if they were deployed in communities today. People are not going to tolerate being occupied too long." 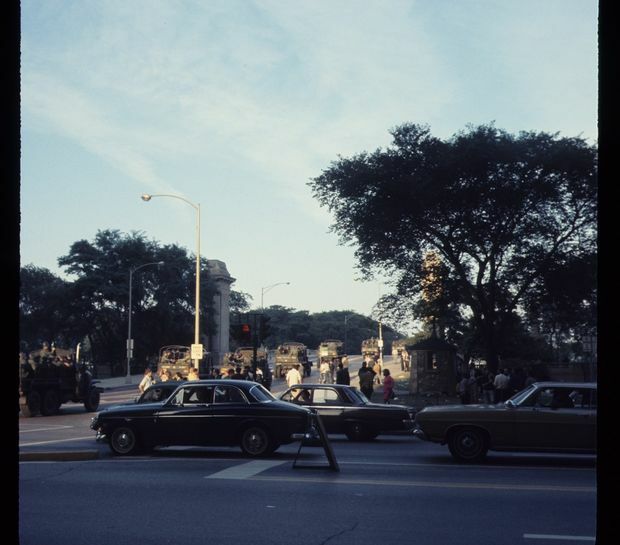 Later in 1968, the National Guard was called in to help with the Democratic National Convention. The convention famously saw protesters pitted against police and Guardsmen in violent clashes. The National Guard's relationship with black communities is particularly fraught, Williams said, since being used to quell protests during the civil rights movement. The tension between communities and Guardsmen could "heat up" like it did in '68, Williams said, leading to civil unrest. What would make it worse is that now people have more access to "high-powered weapons," which could be a "huge problem" if community members — and particularly gangs — see the National Guard as an occupying force, Williams said. 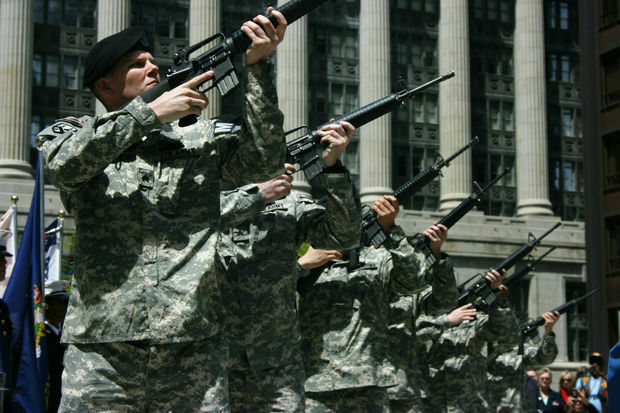 Could the National Guard come to Chicago? The National Guard can be called into service by the governor or president. It's unclear where Trump stands on the issue. The incoming president said in a Jan. 3 tweet that Emanuel should "ask for federal help" to deal with Chicago's violence, but he did not explicitly say whether that help should come in the form of the National Guard. Trump could run into problems with the Possee Comitatus Act if he tries to use federal power to push for the National Guard to intervene. The act prohibits certain federal troops from being used "as a posse comitatus or otherwise to execute the laws," though a possible exception could mean federally empowered National Guard troops can be used to stop domestic violence. What would the National Guard do? It's not immediately clear what the National Guard would or could do. Guardsmen don't have policing powers, Police Department spokesman Anthony Guglielmi said, and they don't have powers of arrest. Williams said Guardsmen patrolled, helped enforce a curfew and were "stationed" in some communities during the riots of '68. Guardsmen marched Downtown and walked next to protests during the Democratic National Convention. Williams expects things would be different today, though — and said he doubts there'd be enough resources for the National Guard to be present throughout the city to quell violence. "I think just the whole idea of bringing in the National Guard to address violence, primarily in the African-American community … would be shortsighted," Williams said. Communities throughout the city would be hurt by the National Guard's presence, Williams said. Even those who aren't in violence-plagued neighborhoods "would not tolerate the type of inconvenience that the National Guard would present," he said. Do Chicago police want the National Guard to come? The Police Department is focused on things that can prevent crime, like building trust with communities and pushing for harsher sentences for gun crimes, Guglielmi said. The National Guard doesn't play a role in those goals. What else can be done to stop Chicago's violence? Williams said bringing the National Guard to Chicago would be costly, and he'd rather see that money and resources invested in communities hit hard by violence.